Summary: After losing her brother in a terrible incident, Andi Alpers is close to losing it herself. Angry that her mother isn’t coping with grief, and that her father left them in the wake of such a tragedy, all she has left is her music. It’s only when she’s nearly failing school that her father intervenes and decides to take her to Paris. Her only ticket back home- her senior thesis. Before she even gets to the bottom of it, however, Andi stumbles upon a diary belonging to a girl. Even though the courses of two centuries divides them, Andi feels a connection– a connection to Alexandrine’s Paris, and to the lost prince of France. Ever since I was young, I was always intrigued by the French and Russian revolution. For example, the anime The Rose of Versailles was the intro I got about the subject (I was 12 then, I think), and from there on, a couple of books as a teen (those will be mentioned below). There are A LOT of material on both, especially since there are never any solid records. 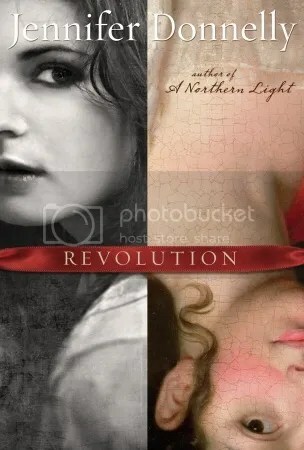 I’m glad to say that Revolution is a great addition to many historical fiction books on that topic. I really loved Andi, despite her meanness and messed up self. I find that I’m usually tough on those “tortured” characters, but I really sympathized with Andi, and I loved her voice. Her sarcasm was cutting but engaging, and her narration heartfelt. Of course, that’s not to say that I didn’t choke up with tears. God, both Andi and Alexandrine did a good job in that. There were a lot of parallels between characters from the revolution and from Andi’s present life, and it seemed like too much of a nudge of “oh what a coincidence- but no not really”. Still, the amount of research put into this, and the way Donnelly weaves it in set me on an online search-hunt for the true events, and I love when books do that. It was a moving and heartfelt read that shows the complexity of history and the idea of revolutions. Audience: Older teens and history buffs (Andi is one angry gal!). ASDFGHJKL!!!!! ONE OF MY FAVOURITE NOVELS!!!!!! AMAZING! !